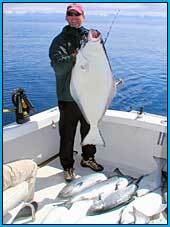 A Combination Salmon/Halibut fishing charter is a great trip if you’re short on time and want to try both. 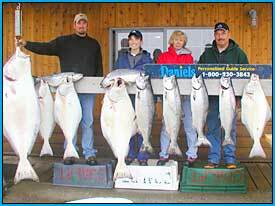 With the limited time given to each species it’s harder to target large Halibut and usually we’re satisfies with the good eating fish. 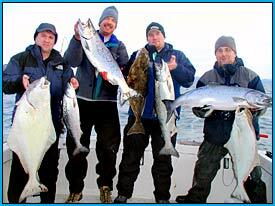 There’s than a change of gear and run to the Salmon grounds where you’ll troll for Kings or Silvers depending on the time of year. 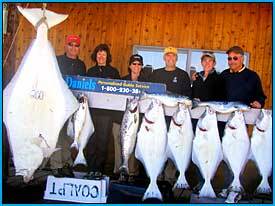 Daniel usually tries to give equal time to each species unless you have chartered the boat and want otherwise. 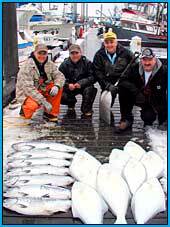 Combination trips work well if you’ve chartered the whole boat. 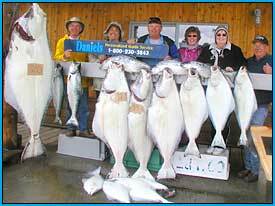 We don’t charge extra to do both if you get the whole boat so with that kind of flexibility Daniel can easily do what the group wants. 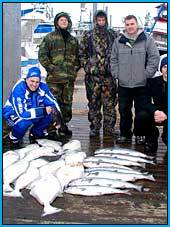 If you’re tired of Halibut fishing and ready for a change you can make that call or if you want more time to try and find a bigger Halibut knowing your cutting into Salmon fishing time you can make that call as well. It’s your boat to do what you want with.